The Esso Great Hall is home to The Stanley Cup, every major NHL trophy as well as portraits and biographical sketches of each Hockey Hall of Fame Honoured Member. Get up close & personal with the Stanley Cup on display in the spectacular Esso Great Hall. Click on below photos to expand. The Dominion Hockey Challenge Cup, the original Stanley Cup, makes its permanent home inside Lord Stanley's Vault at the Hockey Hall of Fame. The Stanley Cup Championship Ring Display. The highlight of any visit to the Hockey Hall of Fame is the Esso Great Hall, the core sanctuary of hockey's proud history. Inside, double glass walls hold portraits and biographical sketches of each Honoured Member of the Hockey Hall of Fame. Originally built in 1885, the interior exhibition components of the Esso Great Hall underwent extensive revitalization in 2012. 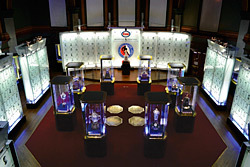 Though maintaining the historic elements of the building itself, the revitalization project featured the re-design and re-configuration of the exhibition space for improved sight lines and visitor circulation, new custom-built trophy showcases, enhanced multimedia content in both official languages and recognition displays to accommodate future Inductees in the next 15-20 years. The Esso Great Hall is also home to all major NHL trophies, the greatest collection of silverware in the world of sports, including the Vezina, Hart, and Calder, stands the most famous and coveted of them all, The Stanley Cup. 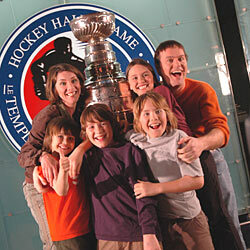 You can also get high-quality prints of you and your family together with The Stanley Cup during your visit to the Hockey Hall of Fame, and even download digital copies afterwards. See details. The north wall of the Esso Great Hall plays host to plaques listing the Elmer Ferguson Memorial Award and Foster Hewitt Memorial Award winners. These NHL media awards, selected by the Professional Hockey Writers' and NHL Broadcasters' Association respectively, pay tribute to members of the writing, radio and television industry who have made outstanding contributions to their profession and the NHL. On the west side of the Esso Great Hall is Lord Stanley's Vault. This specially refurbished bank vault houses the original Stanley Cup donated by Lord Stanley of Preston. On March 18, 1892 at a dinner in Ottawa, Ontario, Lord Stanley announced that he would be purchasing a trophy for which teams from all over Canada would compete. Later that year, he purchased a punchbowl from G.R. Collis & Company in London, England, which was made in Sheffield (years earlier) for 10 guineas (approximately $50). He asked that on the outside of the bowl, it should be engraved 'From Stanley of Preston' along with the Stanley family crest. 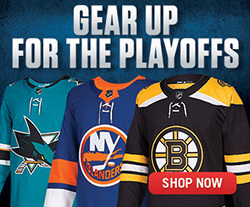 On the opposite side was to read 'Dominion Hockey Challenge Cup.' 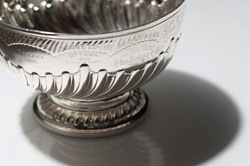 This bowl was first presented on May 15, 1893 at the Montreal Amateur Athletic Association's annual meeting and makes it permanent home at the Hockey Hall of Fame. On display within Lord Stanley's Vault are bands from the Stanley Cup that have been retired over the years, the most recent being the band honouring champions from the 1953-54 to 1964-65 seasons. Also showcased within the vault is the 'Stanley Cup Championship Ring Display' which features not only the 2018, 2017, 2016, 2015, 2014, 2013, 2012, 2011, 2010, 2009, 2008 and 2007 championship rings, but also the first ring ever presented in 1893 to the Montreal AAA along with rings from the Black Hawks (1961), Flames (1989) and Penguins (1991). 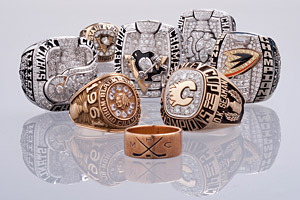 In all, over 20 Stanley Cup championship rings are on display. Next door is the Honoured Members Lounge, where you can relax in wing-backed chairs and listen to games called by great radio announcers of the past. Check out the trophies on display in the Esso Great Hall. 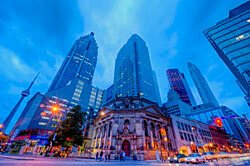 An elegant venue, perfect for banquets, dinners, receptions, meetings, and private functions. 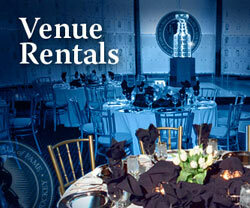 See Private Events and Venue Rental.